Top Hat (1935, Mark Sandrich) and The Music Room (1958, Satyajit Ray) both operate using elements of the musical, but both produce very different results. Both films use music and sound to drive certain characters together, while alienating other characters. Both films also have characters who express themselves through the performance of music, but this is where the films diverge. In Top Hat the characters use music to express excessive emotion (except in one case which is strictly performance for its own sake), while in The Music Room the music performance explicates the social status of the characters. Top Hat sets its tone towards music and sound in the first few sequences. In the first scene following the credits, male characters in a lounge are reading newspapers in exaggerated silence. The first character to break the silence is Jerry Travers (Fred Astaire), as he struggles loudly with his newspaper he gets aggressive gestures from the patrons surrounding him. Immediately he is set apart from the other males in the scene, and the sound he produces is established as creating hostility towards him from these men, who are not able to appreciate him. He is joined by Horace Hardwick, who also makes noise, and is involved with producing a stage musical starring Travers. The scene is punctuated as Travers leaves the room and does a brief loud tap to the irritation of the men in the lobby, who stand and protest. In the next scene Travers and Hardwick go up to their hotel room where after a brief conversation Travers begins dancing. Upon his dancing we are introduced to Dale Tremont (Ginger Rogers) who is awoken by the loud dancing above her and eventually goes up to investigate it. Travers insistent tapping brings him together with Tremont, the first of many times this will happen in the film. Later in the film, the two seek shelter from the rain and she is brought into his arms by the sound of thunder. Travers explains the thunder as being an aggressive cloud and a fluffy cloud getting together and creating sparks, which is a pretty much what Travers and Tremont do in the scene – dancing together for the first time and immediately falling in love with each other. The next musical sequence in the film is Travers performance onstage, with a group of men identically dressed in tuxedos dancing behind him. The song climaxes with a solo dance number, where Travers using the noise of his tap shoes and his cane shoots down the men who had been dancing behind him. This is another example of Travers using sound or music to distinguish himself from the rest of the group aggressively. That Travers is dancing this number for a packed theater is the film’s third expression of musical performance in the film. He concludes this scene by shooting down the final person, his friend and director Hardwick. 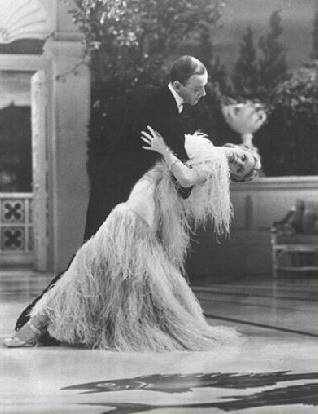 The next performance in the film is probably the most famous, the “Cheek to Cheek” number, which further develops the love between Travers and Tremont. 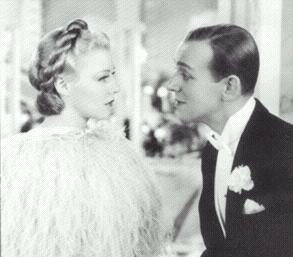 It is worth noting that as they dance and Astaire sings “Heaven, I’m in Heaven” ginger Rogers is made up in a fluffy, feather dress that makes her look angelic (even though it sheds throughout the entire dance sequence). That they are pressed up against each other for much of the song, establishes their emotional bond towards each other, and since they dance up to a different platform from the other dancing couples this is another song that helps alienate these characters from the others. In The Music Room, music is used initially to show the bond between Lord Huzur Biswambhar Roy (terrific actor Chhabi Biswas) and his son the Prince. They perform music together and seem to have and appreciation for music that Roy’s wife does not share. The only think Roy is shown doing in the film with his son is performing music with him and this creates a great deal of importance for this shared action. The other essential music performances are at Roy’s parties in his music room and later the offscreen parties thrown by Mahim Ganguly, Roy’s nemesis. In both cases the musical performances at the parties are meant to represent wealth and class, not so much art for its own sake. The performances are somewhat ritualistic, with the performances waiting for Roy’s entrance – at the front center of the crowd. They are also shown as financial burdens to Roy, who has to mortgage his wife’s jewelry in order to put them on. Although Roy is shown enjoying the music, they are at least equally important for showing his aristocracy -separating Roy from his neighbor Ganguly. The three key performances at Roy’s house come at three central points of the film. The first establishes the expectations of the party and Roy’s financial burden in giving them. The second occurs during a bad storm that increasingly draws Roy’s attention, as pretense to the death of his wife and son. The third comes after many years, after a long lapse in Roy’s activity and squandering of his wealth. The third performance finishes Roy off financially and basically kills him. At the climax of the third performance Ganguly tries to be the first to throw money performers, which Roy stops and chastises him for. This is the privilege of the person putting on the concert, something that Ganguly did not know to acknowledge. This shows the growing change of the privileged person, later driven home by the pictures of Roy’s ancestry that hang around the music room. The candles burn out as Roy acknowledges the past, establishing an ending to the performance, the aristocracy and Roy’s life.